An update from the road... we're on our grand tour and we're in Montenegro! This is the longest I've gone without posting on my poor neglected Cool Travel Guide. You want to know why? Drop by Grantourismo and you'll see that we've been a tad busy on our yearlong grand tour of the world, which we embarked on in February in partnership with HomeAway Holiday-Rentals. 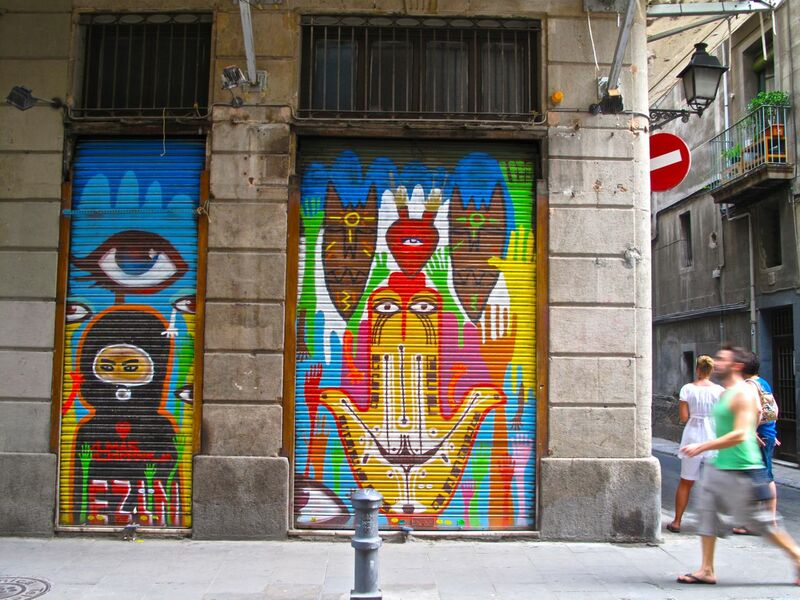 So far our trip has taken us from Melbourne via Dubai to London, Marrakech, Essaouira, Madrid, Jerez, Barcelona (pictured), Ceret, Perpignan, Paris, and now we're in Kotor in Montenegro. We're busy, but we're meeting some amazing people, having some extraordinary experiences, and we're generating some top quality content of which we're really proud: go take a look! I won't be neglecting Cool Travel Guide for much longer though... I have plans to re-launch the blog very soon, which I'll share with you shortly. In the meantime, do come and visit us at Grantourismo - even if it's just to drop by and say hello! Life has been keeping us busy as usual with our Gran- tourismo project now well and truly under way; you can keep up with our travels and what we're doing here. We've had a few bits and pieces published in print and online in January and February, which we wrote last year, that I wanted to share with you. * The first edition Cyprus TwinPack guidebook I wrote for the UK's AA Publishing was released in January. I really like AA's revamp of the TwinPack series - the book's design is much more clean and stylish-looking now. * In the January issue of Gulf Life, Gulf Air's in-flight magazine, Terry and I had a piece on the sleek one-of-a-kind sheesha pipes that the manager of Doha W's Wahm Bar commissioned in Designer Sheesha in Doha: blowing bubbles has never been so cool, while in the February issue we've got a piece on Wild Peeta, a fantastic fusion shawarma eatery started by two Emirati guys. * The February issue of J Mag, Jazeera Airways in-flight magazine includes more of our stories and pics, including Twitterabia, about the rise in popularity of Twitter in the region and how tweeps in the Middle East are meeting face to face and forming 'real' friendships; Future Planning, about three young Kuwaiti architects hoping to make Kuwait a better place to live through their re-thinking of what's appropriate architecture for the country and their blog Re:Kuwait, aimed at opening a public dialogue on the subject; and Guitar Heroes, a piece about the heavy metal scene in Kuwait, though we're not happy with this last story at all, censored for political/religious reasons. We were asked to remove references to the 'devil's music' and the real challenges the musicians are facing - and we never called the guys geeky! If you're interested in the full story and would like to see the original piece, leave a comment below and I'll email it to you. * The Jan/Feb/Mar edition of Carlson Wagonlit's Asian-based business travel magazine, Connect, features a '24 Hours in Dubai' piece I wrote. * The January edition of UK travel magazine Wanderlust contained a special Jordan supplement with a couple of pieces I wrote on Jordanian guides, including a profile of an award-winning guide and recommendations and advice by some of Jordan's best guides. * In the Ritz-Carlton magazine's Winter 2010 edition, you'll also find a small piece I wrote for the Doha hotel's concierge. * We also had a couple of pieces on the Viator blog, including UAE: a Winter Wonderland, and a piece introducing our Grantourismo project (Viator is one of our project partners). Pictured: a wall of graffiti in Kuwait City, against which Terry shot fantastic portraits of Kuwait's heavy metal heroes for our Jazeera magazine story. 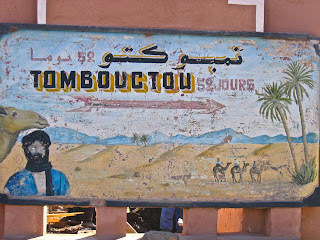 Terry and I have been dreaming about doing a grand tour of sorts for a few years - since way back when we wrote the Grantourismo blog for Charles and Marie. We started to seriously develop the idea of a reincarnation of Grantourismo about a year ago, but we hadn't yet begun to think about how to fund it. Our original plan was to stay in one destination for a month at a time, and to really try to get beneath the skin of the place, to get to know the locals, learn as much of the language as we could, to learn some things unique or special to the place, and to write a book about the project. We were over the moon when we discovered that HomeAway Holiday Rentals had a similar marketing exercise in mind, their idea being to send a couple of travel writers around the world to explore a more enriching and authentic way of travel that was possible through holiday home stays, rather than hotels. It was a godsend that they believed our project would fit, and we were happy to compromise a little (two destinations a month instead of one) to be able to make it work together. I'll tell you a little bit more about Grantourismo in coming posts. I'm a fan of Twitter but I was on deadline and only half-following tweets a few nights ago as messages streamed in from people in the UAE at the inauguration of the world's tallest building Burj Dubai, since renamed Burj Khalifa. A few made me giggle, like that of @OmaReina who re-tweeted @trebbye:"#BurjDubai is now Burj Abu Dhabi...I mean #BurjKhalifa, as stated by his highness", a reference to more affluent neighbouring emirate Abu Dhabi's financial bailout of its debt-ridden cousin Dubai. (For further explanation, see this piece by Dubai's Financial Times writer Simeon Kerr). While there were the usual expressions of cynicism from Dubai's many critics (some very witty), I was drawn more to tweets by Emirati and expat tweeps for their raw emotion and passionate expressions of elation and pride. As the messages streamed in at a rapid pace by tweeps determined to see the symbolic structure become a trending topic on Twitter, I have to admit I got a tad emotional and wished I was there with friends. You see, although I'm Australian I moved with husband Terry to the UAE in 1998 to work, and while we're permanently on the road now, the country is still our base. I've lived there a quarter of my life and feel more home there than in Australia where I have to admit I feel, well, um... foreign. So when twitter pal and Matador editor Julie Schwietert (@collazoprojects) tweeted: “You know what I don’t care about? 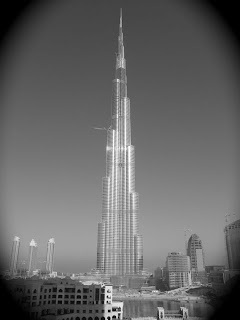 The Burj, that’s what.” I felt compelled to respond. Not criticize. Just explain that "The people who care about the Burj are the people who live there & love the place, and for whom it's symbolic of so much..." (and, cause I needed more characters) "...which is why I care about it; I think we must feel the way Aussies felt when the Opera House or Harbour Bridge opened." Because that's what I'd been thinking as I half-watched the tweeps coming in that evening. As I read tweets about workers injured during the construction of Burj Dubai, I recalled reading many years earlier in a popular culture class at uni about the many men who had died, were injured or went deaf while working on the Sydney Harbour Bridge, an initiative that created a phenomenal debt that wasn't paid off until the 1980s. I also remembered old black and white photos I'd seen of the opening ceremony, presided over by the state premier, with a 21-gun salute, Air Force fly-past, marching bands and decorated floats, all considered very extravagant during times of depression. Sydney's bridge is now a major tourist attraction, the Bridge Climb considered a must-do activity for visitors, and a place of celebration, with Sydneysiders streaming over it for its anniversaries and other significant events. The bridge is the centrepiece for every New Year's Eve fireworks, when the country anxiously waits to see (after weeks of speculation) what illuminated symbol will appear on the structure following the dazzling display - it was a disco ball one year, a dove of peace another. But, more than anything, like the Sydney Opera House and other great iconic monuments, the Sydney Harbour Bridge is a source of immense national pride. Its completion not only united the city when it connected Sydney's northern and southern shores in 1932, but it also united a nation during very challenging times. I suspect Burj Khalifa has done the same. 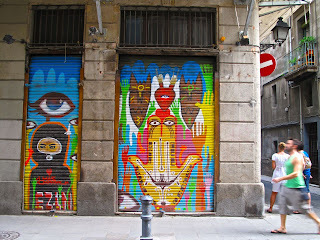 The posts I will be popping up on my poor neglected travel blog over the next few days have been a long time coming. Some I drafted back in Beirut in November, others I scribbled almost a month ago while I was recovering from bronchial pneumonia from a hotel room in Bangkok where we were working on a guidebook. That diagnosis, by the way, based on nasty symptoms like coughing up blood, came from my doctor uncle in Australia by email because I was too busy working to get to a GP. It would be an understatement to say that 2009 has been a hectic year of travel and writing for Terry and I - something I only recently appreciated glancing at all the books we've written which have been published this year sitting on the shelf beside my desk here at my family's house in Bendigo, Australia: Footprint Italian Lakes, Thomas Cook Northern Italy, and Thomas Cook Travellers Calabria, plus a handful of books I updated for AA and Thomas Cook. Then there are others we've written that I haven't even seen (like the Rough Guides Clean Breaks, which I contributed to) or are not yet published, like the new edition to the Rough Guide to Australia (for which we updated four and a bit states - half the country! - on a four month-long road trip from October 2008 to February 2009), and another first edition, Back Roads Australia for DK. I skim down this page scanning my posts, and while there have been few compared to last year or the year before, when I stop at In Print and Online and then take a look at that archive I see why. We may continually read the claims that print is dead yet we've spent more time writing for magazines this year than any other, and up until we returned to guidebooks in December we'd spent six months solid doing little else but write for magazines. The irony is that we've now been hired by HomeAway Holiday-Rentals for a year to travel the world, stay in their properties, and blog about the experience - something I never could have predicted. So the travel blogging that for me had been an escape from my 'day job' as a travel writer now becomes our main source of income. Print is still not dead, however - as much as our new client appreciates social media, they are still going to pay us bonuses for every article we get published in a magazine or newspaper. So I'm expecting it's going to be another busy year, but I'm pleased to say that we'll be slowing down considerably. No longer will I be envying a donkey his pace. More on our new project, Grantourismo soon. Pictured? 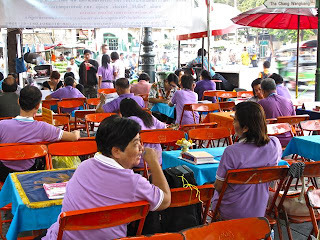 Fortune tellers in Bangkok. Which hotels do travel writers check into when they go on holidays? That's what Mark Hudson, a writer himself for The Sunday Times, among other publications, was keen to know, so he asked 50 of them (including myself) and published their recommendations, 'Where travel writers pay to stay', on his site 101 Holidays. I've been meaning to share this one with you for a while. If you're a regular Cool Travel Guide reader, you'll know (from this post and others) that I've been increasingly frustrated with user-generated content of the kind you get on Trip Advisor, and find myself looking more and more for recommendations by experts, so I was pleased to see Mark do this. Ah, but you say, aren't all hotel reviews in magazines and papers written by experts? Well, yes they are, but they aren't always the kind of hotels that the experts actually stay at when they have a choice. Sometimes hotels are reviewed because they're 'hot properties', newly opened, relaunched, or because an advertiser/business partner has asked for them to be reviewed. 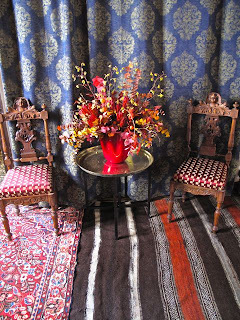 Pictured above is a detail from the sitting room at the Novecento, a hotel we stayed for pleasure, not work, when we attended the Venice Biennale in June - it's not new and not 'hot', but it has loads of charm, is in a wonderful location, and the staff are some of the best around. 1) spam, including friendly on-topic comments across multiple posts where it's obvious you're just leaving comments to try to sell your timeshare apartments or cheap flights. The only exception is where I know you and you are writing from a business address, but even then if you're spamming, I'm sorry I won't post your comments. 2) comments that are abusive, defamatory and obscene. If you have a problem with me or something I've written, then email me directly. But unless you identify yourself and write in a reasoned, calm and considered manner, don't expect me to answer. Life is too short and I don't have time to write to my friends, so don't think I'm going to waste my precious time answering abusive emails. 3) persistent off-topic comments, especially those across multiple posts that verge on stalking. If your comments are off-topic *and* anonymous, then there is no way I'm going to post them. Again, if there's something you want to discuss then email me directly and identify yourself. Bear in mind I'm not going to respond to people who accuse me of being an apologist for Dubai nor am I going to get into discussions about things like the human rights of construction workers there. This doesn't meant I don't care, it just means I don't care to discuss the subject with you on Cool Travel Guide. 4) comments that relate to content I've written for other publishers that has nothing to do with Cool Travel Guide content. For example, an anonymous person recently left an angry comment in relation to a review I wrote on a hotel for a Lonely Planet guidebook because their experience differed remarkably to my own. If you have a bad experience at a hotel, my advice is to complain to the hotel manager during your stay. There's nothing they can do about a noisy hotel room after you leave or if you leave an anonymous comment on Cool Travel Guide. If you've maintained your anonymity, I can't even follow it up with the hotel manager to find out what happened. Complain to the manager at the time of your stay and they can probably move you to another room or help find you alternate accommodation. If I didn't mention the noise in my review, then I obviously didn't experience it myself, but don't question and criticize my reviewing skills nor expect that I'll upload an anonymous comment that does so. HOW YOU CAN EMAIL ME: click on VIEW MY COMPLETE PROFILE under ABOUT ME (right column) and click on 'email' under Contact, however, I can't reiterate enough: don't expect a response unless you identify yourself honestly and provide real contact details. What is Cool Travel Guide? 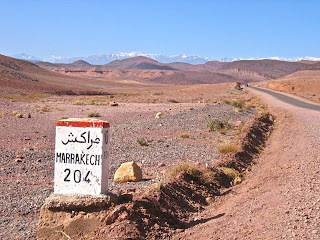 One of the reasons I began Cool Travel Guide was to write about the things I couldn't write about in the highly prescriptive guidebooks I made my living writing. 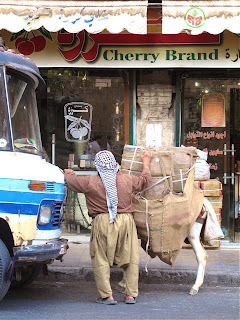 My first post 'Aleppo: no practicalities' explained my motivation and my desire to have a space where I could write whatever I wanted to write. I'm inclined to reiterate what Cool Travel Guide is about and explain my posting policy after receiving a few comments in recent months that I decided not to upload. But first of all, what is Cool Travel Guide? It's a personal travel blog written by a full-time freelance travel writer, that is essentially about the things I find cool (and not so cool) about travel, places, people and culture; about travel writing, the travel media and travel publishing; and about the travel, tourism and hospitality industries. It's a place where I can reflect upon my work as a writer, the places I get to travel to, live in and write about, and the things that affect, impact, inspire, excite and even anger me as a travel writer. Essentially, it's a space for me to write about anything and everything I want to, from hotels, restaurants, airports, planes, museums and beaches, to the actual process of research, writing, pitching, editing, and publishing. Sometimes my writing will be fairly straightforward and my content practical, while at other times my reflections might be more abstract, about the very nature of travel, and why we travel. This is partly because I've worked as an academic and began a PhD on film and travel some years ago, so I'm also interested in the theoretical side. My passion for travel was ignited at age four when my parents moved us from Sydney to Perth for a year, and it developed years later in my teens when they dragged us around the country in a caravan for five years, so occasionally I get nostalgic and reminisce, but it also means I like to ponder the journey and how we move. I moved to the United Arab Emirates with my husband Terry in 1998 to teach film, writing, production and media studies to Emirati girls at a women's university, and I've authored and updated (often with Terry) almost a dozen guidebooks and scores of stories on the country, especially on the emirates of Dubai and Abu Dhabi. That's why you'll find lots of posts on those destinations here. I love the UAE and make no apologies about that. I'm also fascinated by the media's coverage of Dubai, and how it's promoted, perceived and reported on as a destination. If you want to comment on my posts, or just write to me about any of those or other related topics, I'd love to hear from you. Really. There's a reason I haven't been blogging much these last few months - or rather, lots of reasons. Terry and I have been busy travelling, mainly through the Middle East - to Syria, Qatar, Kuwait, Jordan and Lebanon - on commissions for a number of magazines, and squeezing in some assignments at 'home' in the UAE in between. We continued to do a lot of writing for in-flight magazines, especially Gulf Air's Gulf Life and Jazeera Airways' J Magazine (as I told you last time I wrote one of these updates in October), mainly because the editors are so easy to work with, and the magazines are fun. In Gulf Life's November Heritage issue, we had a piece on Doha's stupendous Museum of Islamic Arts, and in the latest edition, December's Food issue, we've got a feature on our experience behind-the-scenes with Michelin-starred chef Pierre Gagnaire in his kitchen at Reflets, Dubai (which I blogged about here), and small pieces on Jordan's cupcake king and owner of Sugar Daddy, Fadi Jaber, Amman's heavenly mussabaha, hommous, foul and falafal place, Hashem, Kuwait's best burger joint, Slider Station (pictured), and Dubai's colossal sweet shop, Candylicious. In December's issue of J Magazine, we've got a feature on Kuwait's fabulous four women politicians and Aleppo's food biz family and their matriarch Dalal Touma, the woman behind one of the city's best restaurants, Zomorod. You'll also find Terry's lush images illustrating our stories and lots of our reviews of restaurants, cafes and shops in the magazine's Destination Guide. One of my reviews went up on i-escape, on Kangaroo Island's Southern Ocean Lodge (and you'll see a lot more of my reviews soon on the site on properties in Australia and Syria), while our review of Doha's Four Seasons hotel went up on Travel Intelligence. We've got a lot more pieces coming out in early 2010, everywhere from Asia's Connect to the Ritz Carlton magazine, and I'll let you know about those as they appear. Only two of the nine countries we visited in the last six months were new to us, places we hadn’t been before and were experiencing for the first time. 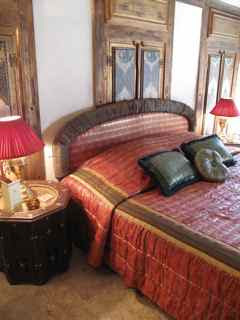 Obviously, as travel writers, it’s inevitable that we end up returning to places time and time again, particularly as we develop expertise in certain places, as my husband Terry and I have with the Middle East where we've been based since 1998. But while I love the excitement and energy of the new and relish opportunities to get out of our comfort zone and go somewhere we haven't been before (there’s nothing quite like that first drive from an airport into a new city, is there? ), I also enjoy returning to places we’ve been before, some times many times before. Because there is a certain affection that grows over time as you become more familiar with a place, don’t you think? The more you visit, even if you’re not exactly besotted by the destination, the more you come to develop a bundle of warm feelings for it. And when you return… well, it’s just like seeing an old friend again. Love them or hate them, you just want to hug them! What do you think? Know those feelings? Which do you prefer? The familiarity that comes with the known or the excitement of the unfamiliar? Pictured? Dubai, the closest thing I have to a home, and a place I love more and more each time I return after being away. Are you a once-in-a-lifetime traveller or a creature of habit? Are you a ‘once-in-a-lifetime’ traveller? That is, every country you visit you consider it to be a ‘once-in-a-lifetime’ experience and treat it as such? Do you go to a place thinking you may never get back there again so everything you do is a special adventure? Do you go with the idea that you won’t even dream of returning because there are simply too many other amazing places to explore in the world? Maybe it's more of a financial imperative? Or, do you travel thinking you are definitely going to return some day, so you take it easy, kick back, and don’t put too much pressure on the trip? And in doing so, you find you appreciate the place and the little experiences and everyday moments more? Indeed, if this is a place you end up liking a lot, you won’t have a problem returning the next year, and the next, and perhaps the one after that… so that by the time you’re 80 you could be leaning over to the diners at the next table one night to boast “my husband/wife and I have been coming here every summer for the last 30 years”, as a very contented woman told us one evening in Capri as her beloved husband sliced a ripe juicy peach for her after their meal – a habit that seemed so matter-of-fact, he’d probably been doing it for 30 years… So, which traveller are you? Do have one travel preference over another? Or do you mix it up with destinations you treat as once-in-a-lifetime experiences and favorite holiday spots you return to every year? I'd love to hear your thoughts. I've been silent for some time, I know. We've been on the road again in the Middle East on commissions for a few in-flight and travel magazines, and our pace has been hectic to say the least - from hiking and camping at Wadi Rum to floating and spa-ing at the Dead Sea, we've done it all these last 5-6 weeks. I've barely had time - or an internet connection - to blog or tweet, but Twitter has been far easier to update, so if you can't find me here, you can come and check in on what we're doing there: www.twitter.com/laradunston. We're leaving buzzing Beirut tonight and heading back to Dubai so I'll update you all from there. 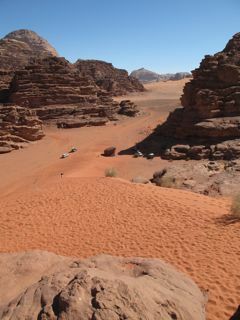 In the meantime, an image from Wadi Rum. A recent hotel stay reminded us of just how bad they can occasionally be. We checked into a respectable five star city hotel in the early evening, did some work, then went out to dinner and checked out a bar afterwards. We'd had a really exhausting day - morning shoot, long drive, flat tyre, an important appointment we almost missed. You get the picture. We rocked in from dinner around midnight, got changed, and dragged ourselves to bed, only to find the bed - the sheets, the edge of the pillows and the doona (quilt, eiderdown), well, um... damp. I took a sniff. It smelt okay, like water. No air-conditioning above the bed. Perhaps the laundromat hadn't properly dried it and it then dampened everything else? I called the front desk and explained. Half an hour later a housekeeper showed up without fresh linen. We explained again. He disappeared. He returned another 20 minutes later with fresh sheets, but no doona, no mattress protector. Bring a friend, I called out, as he disappeared, as you'll probably have to turn the mattress over too. He returned another 15 minutes later with a colleague, mattress protector, and doona. However, when they pulled off the mattress protector to turn the mattress over, we saw an enormous yellow circle. Yes! Urine! Why on earth a maid had remade a urine-soaked bed in a five star hotel that clearly wasn't full was beyond me. By 1.30am, the Night Manager had moved us. Did I ever tell you about the bed bugs story? So, what was your worst hotel experience? Pictured? Definitely not the hotel in question - that's one of our better hotel experiences. I am probably suffering from chronic information overload - how about you? - but increasingly I'm finding myself wanting to read more informed opinions from people with experience and expertise in a subject, no matter what the area, but especially travel. If I'm doing research or simply trying to stay abreast of trends, I don't have the time or inclination to sift through reviews and advice from people whose backgrounds and qualifications I know very little about. Which is why I very rarely visit Trip Advisor (see my post of yesterday for more on user-generated reviews) and which is why I was so happy when the smart people at Uptake, in partnership with BootsnAll Travel Network and Tips from the T-list, started Travel Insights 100 (and also asked me to join!). Travel Insights 100 consists of 100 opinion makers in travel, from tourism industry leaders to travel writers and bloggers. Essentially it's an online forum where you can find a diverse group of travel experts and a place for discussion about the issues and changes affecting travel around the globe. You'll find members' blog posts, RSS and Twitter feeds, as well as the results of surveys of the members that Uptake will undertake and release from time to time, the first of which was a survey - what else - on Twitter. Check out the actual results here and a summary here. And do let me know what you think. Travel 'experts', whether they are travel writers, guidebook authors, travel bloggers, tour guides, travel agents, hoteliers etc, are also 'real' travellers in my mind. Yet publishers and travel sites are frequently pitting the two against each other. Sure, the travel experts sometimes get special treatment and they can rarely shut themselves off from the act of reviewing, even when they're on holidays, but the fact is that they do take holidays and do travel like 'normal' people too. I book my flights and hotels online. I have to negotiate local transport like you do. I eat as many bad meals as I do good ones, and I also get allocated my share of crappy hotel rooms too. Yet increasingly the opinions of the experts - the people who stay in hundreds of hotel rooms a year, catch scores of flights, and talk to thousands of other travel experts and travellers - that is, the people who make it their business to accumulate vast travel experience and knowledge and develop skills at discernment - seem to be increasingly undervalued and overlooked in favor of the opinions of 'real' people. One example is the hotel reviews in Budget Travel (a magazine I love, by the way), such as this one which states that "Online reviews generally praise the hotel as an affordable gem with a fun, unique theme" and "Reader Dawn recommends Franklin Feel the Sound, where she stayed in June 2009. She writes that the Franklin exceeded her expectations and was excellent value". Frankly, unless I know who these online reviewers were and have more information about them and Dawn, I don't care what they think. I want to know how much hotel experience they've had, how many hotels in Rome they've checked into and inspected, and how many hotels they've stayed at fullstop, so I can then determine what their idea of "affordable" or "unique" is, and how different their expectations may be to that of other travellers. You see, travel experts know these things. What do you think? Being able to spend a night in the restaurant kitchen of a Michelin-starred chef - in this case that of Pierre Gagnaire at Reflets, Dubai - is one of the delights of our job. 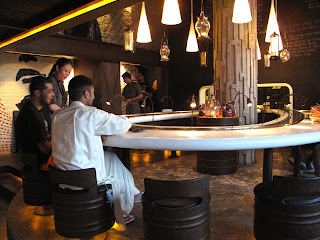 It wasn't our first time - which was Bacchus at Read's, Mallorca, where we dined at the Chef's Table and Terry did a Master Chef experience with Felix Eschrich - but our night at Reflets was probably one of our most enlightening and educative experiences in a restaurant kitchen. And Terry and I have both spent a lot of time in kitchens. I worked in Sydney cafes to put myself through uni and during high school for pocket money, while Terry did a stint working weekend nights in the kitchen of a friend's Surry Hills bistro to keep himself out of trouble when I went to South America to do my masters. But these were no fine dining restaurants! It would be inconceivable to think that a chef in a Michelin-starred fine-diner would retrieve a salad he'd dropped intentionally on a dirty floor, plopping it back in a bowl to be served to an impatient customer as one drug-crazed cook did in the kitchen of a popular Balmain cafe I onced worked at. What I also find inconceivable, after these Michelin-starred kitchen experiences, are the abusive Ramsay-like tirades of the kind we see on Hell's Kitchen. Because the atmosphere we witnessed in both kitchens was one of calm. No yelling. No screaming. No chaos. Very little confusion. Over the course of 3.5 hours of service at Reflets, we only heard the head chef shout "Allez! Allez!" a couple of times and witnessed a few minor moments from the sous chef, irritated with the energetic expediter who could occasionally be a little too eager to send unfinished plates out. 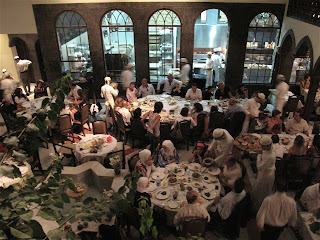 In stark contrast, the chefs were cool and composed, the kitchen quiet. There was still a buzz, a real energy about the place, but it was a positive one. Throughout the night, when not checking plates, watching his team or talking to diners, a patient Pierre Gagnaire took time to explain, answer questions, and even ask us about our work and travels. He brought us delicious morsels of food that we savoured - some foie gras here, lobster ice-cream there - while Head Chef Olivier Biles brought us bottles of water and periodically asked if we were okay. Servers ducked out of range of Terry's camera and apologised for getting in our way, when we were the ones clearly in their's. What struck us is how extraordinarily professional, how kind, and how hospitable chefs of this calibre can be. It's their generosity in such stressful conditions that is most remarkable. But then it really shouldn't be surprising because when we talk to chefs about why they do what they do, mostly they say they do it to give pleasure. And how very pleasing the experience was. I'll let you know when the story's out. Pictured? That's me chatting to Pierre Gagnaire. It's been a busy period for Terry and I, as you've gathered from the dearth of blog posts these last months. And we've got a lot of work being published to prove it, from a small 'Up Next' piece on Abu Dhabi in the September edition of National Geographic Traveler to half a dozen eco-experiences I wrote about in Rough Guide's Clean Breaks book. I saw our first edition Travellers Northern Italy guidebook for the first time in a bookshop in Dubai the other day too and got exhausted just looking at it - that was a tough trip. Although I know you don't believe me. We've always written for in-flight magazines, but we've been doing a lot more writing for them these past few months. If you're wondering why, it's because it's fun, the editors are lovely, easy to work with and respond to emails, it's nice to submit a story and see it in print a month or two later, and they pay on time. In September's Storytelling issue of Gulf Air's in-flight magazine Gulf Life, we have features on Abu Shady, Syria's last hakawati or professional storyteller and a review on the Sheraton Aleppo; while in the October issue, we have articles on Syrian sculptor Mustafa Ali; a new Damascus jazz duo comprised of opera star Rasha Razk and pianist Ghazwan Zerkli; and funky Zen bar in Damascus with its fabulous views. All feature Terry's gorgeous photos of course, as does a story on Doha Tribeca Film Festival director - he shot the stunning portrait of Amanda Palmer in the lobby of Doha's W hotel. We've got a bunch of stories in this month's issue of Jazeera's in-flight J Mag too, and in MPI's One Plus magazine a profile on Emirati Ali Al Saloom who is changing the way visitors to Abu Dhabi experience the UAE. So how, as travel writers, do we get ourselves into the situation I described in the last post? And is it possible to be a travel writer and avoid this frenzied pace of life? To answer the second question first, I don't think it is possible if you want to make more than a decent living out of this profession. To answer the first, the way we work now is that we go on a trip with a number of commissions up our sleeves, and then while we're on the ground we follow up more leads for stories and pitch new ideas to editors from that destination. But that doesn't mean that other requests for stories stop coming in. As wonderful as they are, most of the time they're not even related to the destination we're in, which of course complicates things. While we're on the road, an editor might email and ask "Where are you at the moment?" which usually means he/she has a hotel they want reviewed or lead they'd like us to pursue. We'd be crazy to say no. 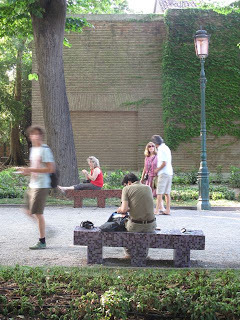 At the same time, the longer we stay in a place and the more people we meet, the more story ideas we develop. Although we worked on a dozen stories in Damascus this trip, I left with twice as many ideas that I'd love to pursue next time. 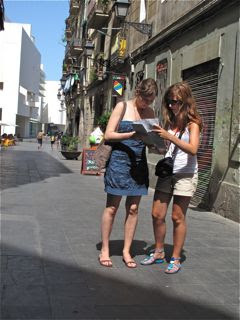 Do we prefer working this way, on multiple commissions, to focusing on a guidebook and a story or two? Absolutely. For one, it pays a hell of a lot more for less work. Secondly, we're meeting way more people doing stories than we did on books because we're no longer pounding the pavements all day every day putting dots on maps and checking transport timetables. But more on that another time. 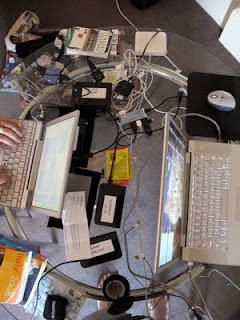 One of the downsides to this frantic pace is that it leaves little time for blogging. But blogging doesn't pay the bills. And for now, I kind of like it that way. I'll tell you why another time. Now, I have a story (or three) to write. 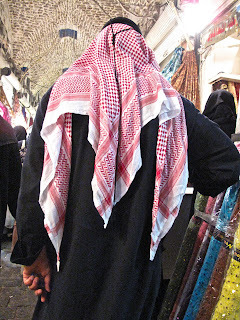 Our recent trip around the Middle East (see this post) wasn't meant to be that kind of trip. There was no guidebook to write. No insane photography commission for Terry to undertake. Just lots of stories and hotel reviews to research and a couple of meetings about a book we're developing. However, somehow a trip that was meant to be fairly straightforward and one we'd hoped would trundle along at a slower pace than normal - a donkey's pace was what I desired - turned into the usual frenzied adventure where we find ourselves running from one appointment to another, and working long days that extend well into the night, every day and night. And now we're frantically writing up those stories and Terry's editing and prepping images for the stories (hence the lack of time for blogging), at the same time as we're pitching more stories, doing more reviews, going on photo shoots, and prepping for the next trip - every day and night, well into the night. So how as travel writers do we get ourselves into this situation? And is it possible to avoid this frenzied life? Desk update from Abu Dhabi: month #45 on the road but whose counting? We're back in the UAE and after a couple of days in Dubai (pictured*), we're chained to desks once again in Abu Dhabi - not our desks, but our friends', at their colossal home in the new part of the capital, off the island. The closest thing to a 'home' for us still being in storage in Dubai. A 'desk update' in publishing-speak suggests a guidebook update by phone and email. It's what publishers commission authors or in-house staff to do when they're not inclined to spend the money to send writers on the road. From what we're hearing, it's happening increasingly of late. But we won't have that. Aside from the fact that we still don't have a 'home' to speak of - this week marks our 45th month living out of our suitcases! - travelling is why we do what we do. Why on earth a travel writer would want to write something from a desk without having been to a place we'll never know. We've well and truly researched the stories and reviews we're currently writing up, having spent the last six weeks on the road travelling around Syria, Qatar and Kuwait. But we're paying for it now. We're tired. Chronically tired. My feet are wrecked. We've both been fighting off the flu for a couple of weeks although poor Terry has finally lost his battle. 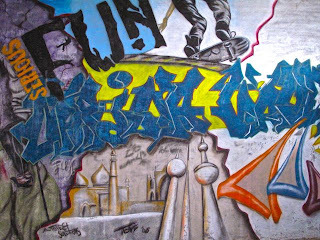 As we write, we're talking to publishers and potential sponsors about future projects - in Thailand, Syria, and the Arabian Peninsula - and in the interim we're considering trips to Lebanon, Jordan, Yemen, Iran, and possibly Kathmandu. We're also contemplating an opportunity that could keep us on the road even longer if it comes off, but more on that in the near future... for now, deadlines await. So what have you been up to and where are you going next? 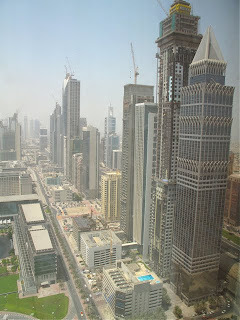 * the pic is of the view from our room at Jumeirah Emirates Towers where we stayed recently; Terry had photographed the hotel and we'd done site inspections so many times over the years, but never checked in. Now we've stayed, we know why it consistently wins awards for being Dubai's best business hotel. While the rooms are a bit dated in terms of their style, they're impressively appointed, the lobby has always been one of the city's buzziest, and the towers and adjoining Boulevard are home to some of my favorite restaurants and bars, including Vu's, Noodle House and The Agency. Another postscript to my posts of a couple of weeks ago on blogging and Blogspot in Syria (see my last post and the postscript before it): after uploading the posts below, I received loads of emails and tweets from around the world, from Syrians asking everything from why I couldn't go to an internet cafe where it's often possible to access Blogspot (sorry, we were working 16-hour days so the only time I had to email was early morning or late at night at our hotels) to foreign and local censorship/IT experts wanting me to provide them with a list of every hotel we stayed at and the hotel's proxy info (apologies again, but one of the things we were doing in Syria was reviewing hotels, so we were moving hotels every second day, and I had enough to do as it was). Based on my recent experience ('recent', because I've never had time to blog on previous trips to Syria), my advice to you is if you're planning to travel to Syria and blog regularly, do your research first but research widely: there are plenty of experts eager to share their opinions (indeed, some rather aggressively) and there is a lot of contradictory advice around (even among the self-proclaimed "experts") about blogging and Blogspot in Syria, from people both outside and within Syria. I found that rarely did opinions align and every expert was able to cite a wealth of research on the subject. Once again, I apologise for not having time to test out your theories and suggestions, but I'm a travel writer who also blogs, rather than a travel blogger who also publishes - and that's likely to stay that way until someone pays me as much to blog as I earn writing. The paid work - which one charming "expert" referred to as "travel fluff" (rest assured, I took her as seriously as she took me) has to take priority, I'm afraid. So, back to work... or writing nonsense? A number of people have contacted me via the comments to my post below and on Twitter in response to my appeal for advice after my blog was momentarily blocked in Syria. Shukran jazeelan to everyone for their tips - much appreciated! 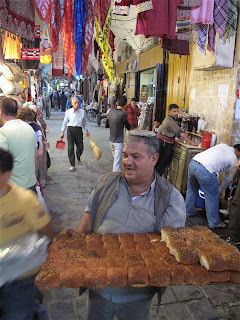 Unfortunately (or fortunately), I'm a busy travel writer with a lot to do here in Syria at the moment - boutique hotels to review, restaurants to try out, artists and musicians to interview - and blogging is not high on my list of priorities at the moment sadly, so I don't have time to test out all your suggestions now. In addition to my lack of time, the intermittent and excruciatingly slow internet access at a lot of the hotels we're staying at means I simply can't get on the net when it's convenient nor wait for photos to upload at the usual size I post them. And I don't have time to keep running back to the Four Seasons, which must have the fastest internet access in town. Quite a few people have written to me about blogspot being banned here and forwarded links supporting this (sorry, but I don't have time to respond to everyone), however, just for your info, I can access a large number of blogspot blogs that I usually read from other parts of the world from Syria (and I was able to access them on previous trips here too), including many listed on my own blogroll, and Syrian-based blogspot blogs that I don't normally read but have discovered on this trip. People are asking me what ISPs I am using and am I using proxies. As I am reviewing hotels, I am moving hotels every couple of days so I'm using whatever ISP the hotel is using and whether the hotel has a proxy or not, I'm sorry but I don't have time to investigate, and would rather be talking to a singer such as the wonderful Rasha Rizk than an IT guy. Hoping you understand. My harmless little blog Cool Travel Guide has been blocked in Syria for a whole 24 hours - I was confronted with the dreaded "Access Denied" sign when I tried to update it yesterday. But, there's been a miracle, or someone came to their senses, and now I can access it. I realize my mistake - my Syrian advisors tell me it's because I used the 'I' word, which I'm not about to use again, so guess all you like. So, how did it get unblocked? Did the censors actually read the content and realise I was a 'friend' of Syria's? Just a travel writer who writes about places she loves and stays clear of politics? Or was it that the Minister for Information and her staff, who were staying at the same hotel as us last night, overheard my loud complaints to the general manager this morning? Either way, I can post for the moment, but if you don't hear from me again, you'll know why. Come and follow me on Twitter instead. Post-script: this post and my tweets on Twitter generated scores of responses via email and Twitter about blogging in Syria. Most were friendly messages from Syrian bloggers, IT experts and officials, with tips on how to get around proxies, using Blogger/Blogspot and other blogging software in Syria, and advice on what's acceptable and what's not regarding blog content. I'm sorry I didn't have time to follow everyone's suggestions - it was an incredibly busy trip with little time for blogging unfortunately - but a huge thanks to everyone who got in touch. 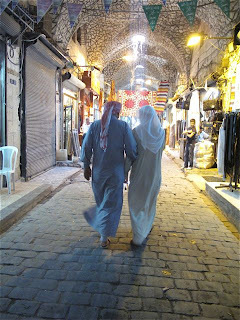 Aleppo's labyrinthine medieval souq - or rather souqs within a souq - has long been one of our favorites in the Middle East, mainly because it has remained relatively untouched by tourism up until recent years - especially compared to Istanbul's Grand Bazzar and Cairo's Khan el Khalili. 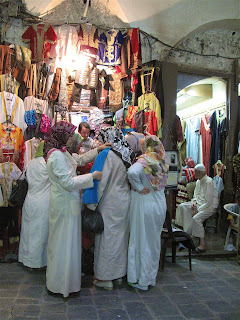 It's a place where locals shop for anything from women's underwear to camel meat, as much as backpackers haggle for hookah pipes and harem pants. 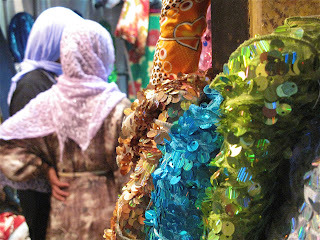 Great buys include olive soap (buy the soap the locals buy, not the soap packaged for tourists), Syria's famous silk brocades and other textiles, and gutras (men's checked headscarves). These days you'll also find stores and stalls with their eyes on the growing tourist market selling jewellery, carpets, and brass and copperware, and spruikers on corners hustling for sales. But we prefer wandering the back-alleys, where the locals shop for their cheap plastic shoes, spangly fabrics, and children's clothes, offering a far more authentic experience. 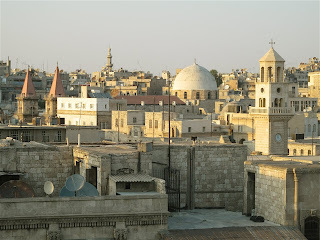 Aleppo is Syria's most atmospheric city after Damascus and it's our next favorite destination after the capital, the highlights for us being the medieval souq, the labyrinthine old quarters dotted around the inner-city, and the complex cuisine, arguably the most interesting in the Middle East. The new town with its stylish cafes - currently full of hip young Syrian expat kids home for the summer holidays - is pretty appealing too. We're here to do hotel reviews and a feature on Aleppo's oldest restaurant dynasty, as well as gather content for other stories, so we've been at the Aleppo Sheraton for a few days. 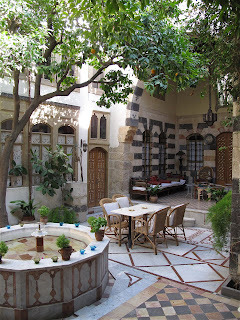 While it can't compare in terms of atmosphere to Aleppo's myriad boutique hotels in restored old houses, the hotel's location, slapbang in the centre of Aleppo, mid-way between Al Jdeida and the souqs, is unbeatable. As is the comfort and space of our room, the big desk, and internet access - things that become more important to a writer and photographer on deadline than sleeping under an Ottoman-era ceiling, I'm afraid. Oh, and the views, pictured, are pretty special too. One of our many reasons for coming to Syria this time was to interview Abu Shady, the last of the hakawati, or traditional storytellers. We last interviewed him almost two and half years ago when we were here to update our Lonely Planet Syria and Lebanon guidebook - that's the 'current' edition every Western traveller is clutching in their hands here now. (We're not using it ourselves - nor are we using any other guidebook - there's no need obviously after so many trips here, but it's interesting to see how many people have a guidebook *and* a guide - very different to last time when there were far more independent travellers around. Why people need help ordering a meal, I'll never know, but it's something I'm going to ponder in another post.) 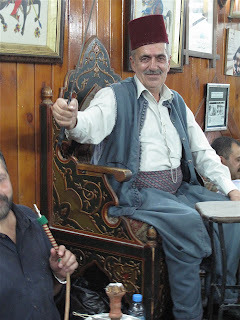 When we last spoke to Abu Shady he was conscious of his age, depressed that numbers of people attending his performances at Al Nawfara cafe in Damascus' Old City were dwindling, his biggest competition being cinema, TV and the internet, and was grooming his son to take over after he died. Ironically, now his nightly performances are packed (people even phone to book tables) and storytelling is more popular than ever (in line with a resurgence of interest by Syrians in everything old), yet he no longer wants his son to take over. Why? Because the pay is lousy. I guess there's a point artists reach when they're no longer prepared to go hungry (or allow their family to go hungry) for their art. I'll pop up the link to our story soon. Pictured: Beit Al Mamlouka's tranquil courtyard with trickling fountain. 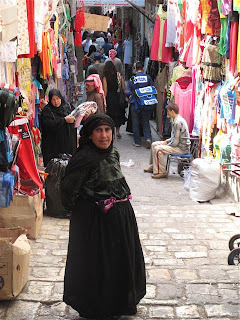 The atmosphere in Damascus is electric now, and the streets of the Old City more alive than we've seen them before - and we've been regular visitors since 1998. Summer traditionally sees Syrian expats from around the world returning home to spend time with their families while Damascus has long attracted Gulf Arab tourists escaping the sweltering summer temperatures of the Arabian Peninsula - while it's warm here now (low to mid 30s Celcius), the Gulf is scorching (average mid 40s Celcius), so Syria is a cool escape in comparison. 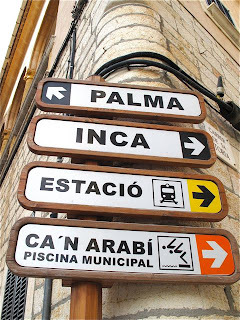 But we're seeing travellers from all over the globe getting lost in the Old City's labyrinthine streets at the moment, including Europeans, Australians and Americans. By the look of their travelling gear - harem pants and hippy attire dominate backpacker wardrobes here - they were expecting a cheap destination. But Damascus now boasts an array of beautiful boutique hotels, an ever-growing number of fine restaurants, a handful of hip bars and stylish cafes, a lively arts and cultural scene, and an increasingly chic shopping area in the new city. We're reporting on all of these for magazines over the next week or two, so I'll try and share a few of our discoveries with you as we go. Pictured? That's Naranj, a relatively 'new' restaurant by Damascene standards, which was very good - the buzzy atmosphere indicative of that found in the whole city at the moment. Although Naranj is not the best, and don't listen to anyone who tells you otherwise - that's a title reserved for Al Halabi at The Four Seasons Hotel, and I'll tell you why in detail very soon. We spent our last night in the UAE in Dubai - stuck in a traffic jam, checking into our fully booked hotel, shopping for last minute necessities at busy Dubai Mall - packed with shoppers laden with shopping bags as late as midnight - and strolling the waterfront overlooking the new Burj Dubai, where tables at the outdoor restaurants and cafes were crammed with families, despite the 45 degree heat. It was the same old Dubai - not the 'ghost town' I'd be reading about in the media while we were in Australia. 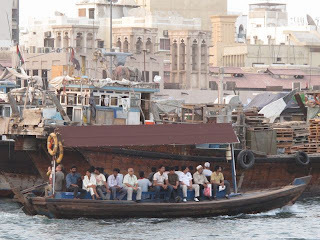 Ironically, summer has historically been the time of year when Dubai is usually a ghost town, when locals and expats who can leave the country for a couple of months evacuate for cooler climates for their summer vacation. 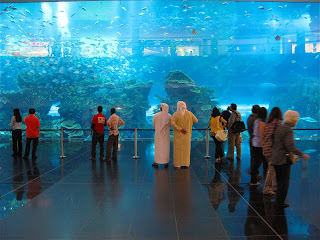 Pictured: the enormous aquarium at Dubai Mall. 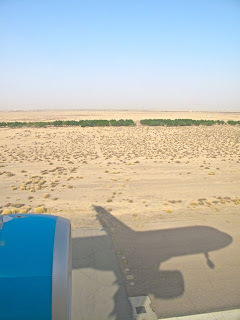 I might not get much time to blog over the next six weeks as we have a tight travel schedule, bouncing around the Middle East researching stories and doing hotel and restaurant reviews. So why not come and follow me on Twitter @laradunston? One of the stories I've been commissioned to write is about how Twitter has been embraced in the MidEast and how it's being used. Twitter users are meeting socially at tweet-ups across the region, getting involved in charity work through Twestivals, and using Twitter for social change. If you're a Twitter user based in the UAE, Lebanon, Jordan, Kuwait or Qatar, or anywhere else around the Middle East, please email me or leave a comment here - I'd love to get in touch with you. 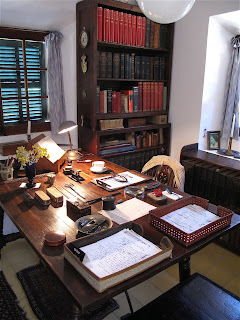 The photo pictured is the workspace of British writer-poet Robert Graves in his former home, now a museum, at Deia on Mallorca. It's the kind of space I'd love to write at. If I didn't live out of my suitcase, that is, and actually had a home in which to write... But who's going to feel sorry for a travel writer, right? The nice people at Trip Base recently gave me a little award - well, I was a finalist in their Best Travel Guides category - and I was so busy I didn't even have time to thank them properly (although I did as I was told and put the badge up). So, a big heartfelt thank you, Trip Base - or shukran jazeelan as we say here in the MidEast. 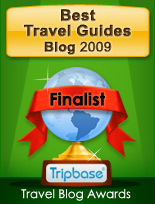 If you want to see which other blogs won awards, you can see the full list here and here, and if you want to know more about Trip Base, check out their site. The picture? 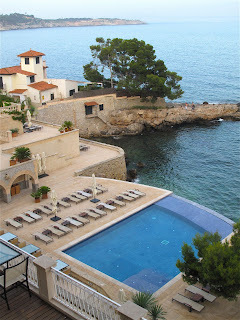 That's Mallorca again, and the view from our room at the Maricel hotel. Well, we're off again. And yet it seems like we'd only just arrived. After five taxing days of sleeping and eating in Barcelona, and before that seven grueling weeks working on a book in Mallorca, the last 12 semi-sedentary days in the UAE have sped by. It's been busy. We had a few days of restaurant reviews, interviews and photo shoots, then time in catching up on loads of writing and planning our next trip from our friend's colossal Abu Dhabi villa, rightly dubbed 'Falcon's Crest'. Picture this: a monumental Arabian villa, sweeping staircase, 20+ rooms, five bathrooms, one of which is nicknamed Hef's (it's all black! ), and a gold falcon over the driveway gate. But, sadly it's all over already and today we're headed back to Dubai to our other 'home away from home', Al Manzil, so we don't miss our early flight to Damascus in the morning. We're trying Jazeera Airways for the first time, and over the next six weeks we'll be testing out a number of low-cost Gulf airlines as we bounce around the region a bit researching stories for in-flights and travel magazines: Syria 2 weeks, Qatar 9 days, Kuwait 5 days, Lebanon 5 days, Jordan 4 days, then back to the UAE again. That's a lot of countries in a short space of time for us with not a lot of time in each place - normally we like to take things a lot more slowly. But it's work, not play: we're doing some feature stories, profiles, and a bunch of hotel and restaurant reviews, as well as having meetings for a couple of book projects we're developing. No, not guidebooks! And for the first time in some years this will be the first trip where we're working on magazine stories only - no guidebooks, thankfully. The last few have really taken their toll... but who's going to listen to a travel writer complain, huh? * CALA TORTA – a beach beloved by locals and expats and popular with travellers on driving holidays, Cala Torta is reached by a winding road through a national park; turn-off just out of Artà on the road to Capdepera. Although the road was recently sealed, there’s still a very rocky, dirt section near the end. There’s a small beach bar and lifesavers, but no toilets, so watch where you step when walking over the sand dunes! * CALA MONDRAGO – in the south near Santanyi, these two adjoining sandy coves boast perhaps the clearest water of any of Mallorca’s beaches; while the first one gets crowded, the second cove is quieter. 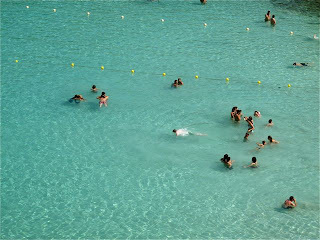 * CALA D'OR - you'll find one of Mallorca's prettiest beaches, with aquamarine water that looks especially lovely in the late afternoon, just in front of the hotel of the same name. Surrounded by low cliffs and white Ibiza-style houses belonging to affluent Spaniards from Barcelona and Madrid, aside from hotel guests, it's pretty much local-owners and wealthy holiday-makers. This is a beach that's worth checking into the hotel for. * CALA SANT VICENÇ – several coves surrounded by rocky sandstone cliffs where the local teens like to lay their towels on the rocky ledges, flirt, and dive from the rocks. 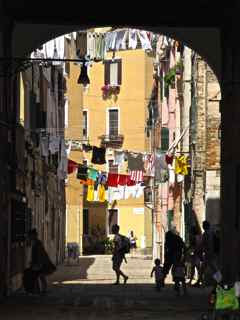 Far from unspoilt though, and the characterless town is comprised of little more than hotels and holiday houses. Don’t stay here, do a day trip instead. 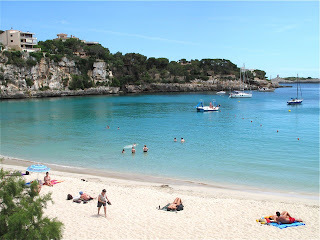 * PORTO CRISTO – this fine beach has one of the loveliest settings, in a bay embraced by low cliffs, and on a day when the sea is sparkling diamonds, and kids are diving off the swimming pontoons, it can seem like one of the most stunning beaches in the world. This is a touristy town, though, with the road running along the beach lined with takeaway food places, generic restaurants, and souvenir shops. There are far worse places to spend a holiday on Mallorca though. What have I left out? What are your favourite Mallorcan beaches? A perpetual globetrotter and travel writer who has experienced over 60 countries, authored 40+ guidebooks, and published 100s of articles for National Geographic Traveler, Wanderlust, Paperplane, Get Lost, Lifestyle+Travel, Voyageur, Hemispheres, The Independent, Lonely Planet, DK, Footprint, Rough Guides, Insight, Thomas Cook, AA Guides, Fodors, USA Today, and more. This blog is about the things that are cool (and not so cool) about travel, that inspire us to travel, and that are inspiring about the places we visit. It's a space for me to reflect upon my work as a travel writer, the travel media, travel publishing, and travel industry. Do you want to buy content appearing on this blog? Romanticism versus reality: what do readers really want? Travel writing: a dream job? Liquid travels: coffee, tea or chai?